Why does the author doubt Sally's psychosis? How does each family member deal with the crisis differently, and what do their reactions tell you about them? The author refers to the illness of James Joyce's daughter and how Joyce copes with Lucia's madness. Discuss the differences and similarities between Greenberg's and Joyce's reactions to their daughters' illnesses. Consider the author's grief over Sally's illness in relation to his mother's guilt over her troubled son, Steven. In what ways are parental guilt intensified in times of crisis? Before her psychotic episode, Sally refuses to believe Pat's devotion to her is sincere. How does their relationship change as Sally battles to overcome the psychosis? How does Pat's revelation about her close friend after the fight with Michael shed light on her devotion to Sally as a mother? How does the Hasidic family respond to Noah's psychosis? How was it different from Sally's family? Were there any similarities? Why do you think Noah and Sally were drawn to each other? Throughout the story, the author interjects scenes that reflect current events happening in the world. 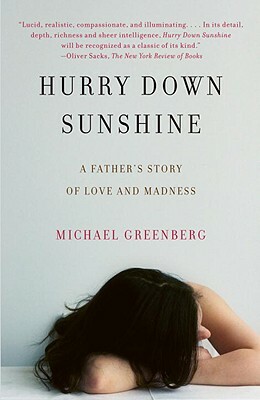 How does Greenberg use these events to give the reader a better understanding of what he is going through? Greenberg's mother arrives at the hospital dressed in a new outfit each day. Similarly, when Greenberg returns to his studio to write for the first time since Sally has come home, he removes all references to chaos and crisis from his book. Greenberg writes, "the harder the blow, the more polish is required". Do you think a mutual need to restore order is an effort to fix Sally or simply a defense mechanism? When Greenberg takes a dose of Sally's medication to try and see the world as she does, the reader also gets a glimpse of that world. What is your reaction? Does it change Greenberg's perception of her illness? How does Greenberg's medicated state influence his meeting with Jean-Paul? How is the narrator's relationship with his brother, Steven, both a responsibility he enjoys as well as a source of burden for him? Cite examples. Greenberg describes infant Sally, as distinctly fiery: "a thrasher, a gripper, a grasper, a yanker of fingers and ears". In what ways does Sally's madness inform the way the author reflects on her infancy and childhood? Compare Sally's use of the name "Father" to Greenberg's own description of himself as her "touchstone of sanity". How does this change after his fight with Pat? In the midst of a crisis, families either pull together or are torn apart. How did Sally's illness change the dynamics between family members? How is psychosis understood and misunderstood in society, and how has this changed over time? If Steven were raised in Sally's generation, do you think he would have turned out differently? Do you feel that Greenberg and Pat and Robin did a good job in caring for Sally during her time of crisis? Would you have responded differently? Would you describe the relationship between Sally's biological mother Robin and her stepmother Pat as tense? Harmonious? What do you think of the position of a stepmother in such a situation? Do you think Dr. Lensing was an effective therapist to Sally? James Joyce called psychosis "the most elusive disease known to man and unknown to medicine." Do you think metal illness is a medical disease or an extreme aspect of who we are as human beings? Throughout Hurry Down Sunshine we see glimpses of Sally's unusual verbal brilliance. Do you think these flashes of brilliance are symptoms of Sally's psychosis or an expression of who she really is? Do you think it is possible to separate Sally's behavior while psychotic from her personality and way of being when she is not psychotic or do they seem to be aspects of a single person?